Way back in college, in a split second one day, I decided I was going to learn how to make books. Really cool handmade, coptic style, hand stitched books. It was one of those spur of the moment determinations that came about during a printmaking class. We had been given the assignment of making books with our prints. I made a book, actually out of my prints. The pages were torn pieces of prints collaged together on wax paper, with more prints/transparencies of sketches I'd done/poems on top. The binding was tape, and it was very very rough looking. I liked it, but when the day came to show the class our books, everyone else pulled out these super cute, professional looking little books with their prints glued inside. Mine was NOTHING like theirs, and I saw in a moment that I had misunderstood the assignment. Theirs all looked roughly the same and mine, well, did not. I still feel grateful to my prof for not pointing out how unprofessional mine looked, but instead praising it's originality. I didn't feel bad about my book, because of the way she handled it, but the moment did make me determined to learn the basics of bookbinding. I played around a bit on my own at home, and then, when the opportunity came, I hooked up with the Minnesota Center for Book Arts and took some classes. I learned what a coptic binding was and how it differed from a Japanese Stab binding. I learned the difference between according books and books with signatures. It was an education gleaned mostly from books, trial and error, and those couple of weekend classes. That's how I learn most everything though, so it was good. And crazily enough that first book became the inspiration for the upcycled art journal in my book. I love it when things like that happen. Today I pulled out some of my first books and handmade books and thought I'd share them and this story with you. Then tomorrow I have a tutorial for making a spiral bound journal from the salvage of an old torn book. It turned out pretty cool so I think you'll like it. Yay! Have you ever had moments like that? Moments when your life took a turn and you decided you WERE going to do something? It might have been something that had never occurred to you before that instance but you were now determined to have it happen. It happens to me every once in a while in art, a couple times with trips (I was determined I was going to go to Italy some day- thx to my sweetie I did!) and once in a while in my personal life or career. How about you? I'd love to hear! Ok- I am SOOOO loving this new website!! It's called Create Mixed Media and it launched yesterday around 3. It's been a long time in the works, I first heard about it last October. But I think they wanted to get it just right. Because it is so much more than I expected. I think it's hard sometimes to explain your vision for something. Even artist/writers can find it difficult and when your idea is something as big and grand as this website I think that makes it extra difficult. So when Rice Freeman Zachary, the writer and artist who was called upon to help lead up this project sent out an e-mail late last fall explaining the ideas she and the other editors had, I found it a little hard to really wrap my head around. Videos, lots of videos, tutorials, materials you love, tours of your studio, pictures of your cat in your studio, anything quirky or interesting that others might be interested in. It seemed like an interactive magazine/you tube/supply source/artist love-in. Frankly my head started to spin. So I was so excited to actually see this vision happen yesterday. It includes a ton of materials and videos, and has artist profiles. But I think what I sense more than anything is that they want it to be a resource. Have a question about encaustics? Check it out under the Make tab. Want to know more about artists or the editors of the magazine? That's the Meet tab. Want to saturate yourself with fabulous videos from the likes of Ruth Rae, Susan Lenart Kazmer, Mary Beth Shaw, or Jill Berry? They're right there under the Look tab. The super cool thing? This is just the beginning. They only went live with this yesterday. I heard from Rice that they are all uploading content like crazy and have only scratched the surface so far. The other super cool thing is that this isn't just going to profile the artist's who've already made a name for themselves. They're here at the beginning, but CreateMixedMedia wants to include any artist who wants to contribute something worth sharing. I'm also excited to see North Light Books partnering with Stampington to support this site. I'm a little partial to both, seeing as the first is my book's publisher and the second, well, I just love their magazines! Plus, they did give me my start by publishing my very first article. These are two powerhouses that if you stop to think about it have access to nearly every amazing mixed media artist out there right now. Imagine if they were all to come play at this new site... and you're starting to get the idea. 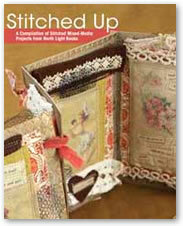 The last little cool bit is that if you download their free e-book Stitched Up, you'll find one of the projects from my book!! It's the Resolutions Wall Quilt and I was just giddy to find it there nestled in with projects by artists like Josie Ciriccione, Ruth Rae, Kelly Snelling, and Kimberly Santiago. I mean seriously- how cool is that? So go now- hop on over, and spend some time getting to know this site. I know you'll enjoy it! We all have our little troubles, the faucet that won't quite turn off, the wiper blade's on the car that just smears your windshield, the closet shelf that keeps toppling over. None are serious, and in fact we probably don't even think of them unless they're right there in front of us. That's what my floss keeper has been to me. The thing is- I love it. There's nothing quite like it, it was my mother's from the '80's, and it's slowly been falling apart. Disaster! I use it everyday and it's been impossible to find a replacement. Granted I haven't looked everywhere, but I have looked. What I've found are trapper keeper type books with places for the floss, or little white cards to wrap the floss around and then clip together. I hate taking the time to wind those things and really just want to flip through the colors, grab my floss, snip some, jam it back into the bag, zip it shut, and be done. It's worked perfectly for me, alas. Step One: On your Cinch machine, pull out the #2 and #11 . The rest of the knobs should be pushed in, so that they don't punch. Then, place a piece of cardstock in the machine as shown. Step Two: Select 3-4 snack bags and flip through them to make sure the corners are not folded in. Hold them together so their directly on top of each other. Step Three: Place in Cinch machine atop of cardstock. Carefully place a second piece of scrap cardstock atop this pile. Step Four: Lift up the top sheet and make sure that the snack bags are positioned correctly and that they are all the way back and flush against the Cinch. Step Five: Then holding down on cardstock/bag stack with your left hand to keep it from shifting, pull down handle on Cinch. Step Six: Pull bags out, and repeat with 4 more until desired number of bags have been punched. Tip: They will sometimes shift and the holes don't always punch evenly. Pull those bags you can't use out and stick them back into your snack box. As long as you're not putting liquids in them, they can still be used as snack bags. Clip bags together with circle clips. Step Seven: Jam it full of floss and enjoy!!!! -First, I'm excited to have a full 2 1/2 hours yet until I need to pick up my little boy. I've got a little more time than usual due to the Kidzart class he has on Tuesdays after school. -I'm wearing my new Tinkerbell t-shirt from disney and have my hair in braids. The combination seems to effect my psyche somehow. -I just found a blog post on Sweater Surgery about my book. She was super sweet about it and shared a project she made that was inspired by the book. That SO made my day. I love that others are finding inspiration in the projects and ideas in the book. -I've been longingly following the posts by others about the upcoming CHA and am now super excited because a friend asked me to meet her at this summer's CHA show. I get to see my friend, AND go to CHA ! That's a big Whoo-hoo! -I'm working on a collection of mini quilts that incorporate my iphone pics that I run through lo-mob. So this morning was spent playing with patterns and colors of fabrics. Gotta love that! So that's my day. Hope you have something in your day today to be excited about too! It truly was one magical week. We went from below zero temps to the mid 70's and sunshine. There was even GREEN grass. I loved it. For the first time ever I found out what it was like to take a middle of the winter vacation down south and I have to say it was pretty grand. My husband, 6 year old son and I stayed at the Animal Kingdom Lodge at Walt Disney World. It was a first for all of us. Neither my husband or I had ever been to Florida and although he'd been to Disneyland as a teen I hadn't ever experienced anything like this before. The lodge was GORGEOUS. There were giraffes, greater kudu's, okapi, zebra's, wildebeest, a long horned animal, African crested crane's, and ducks right outside our balcony at any given time. We loved trying the African foods, although the Mickey shaped waffles were a HUGE hit too (they made them wheat free for us!). We spent a day at each of the parks and even a night at Downtown Disney. My favorite ride was the Kilimanjaro Safari Ride at Animal Kingdom. It was a 25 min. truck ride through a savanna area with roaming elephants, antelope, ostriches, okapi, lions, giraffes, hippo's, crocodiles, and more. I really truly loved it. The details, colors, scenery, all of it made Animal Kingdom just magnificent. I just downloaded 687 pics off my camera and I'd say a good half are from this park. They have African, Asian, Camp, and Dinosaur theme areas. There's a thrilling Dinosaur ride and a super fun 3d bug show (Jasper loved getting sprayed with stink spray- thank goodness it didn't stick to him). But we enjoyed our days at Epcot, and Hollywood Studios too. Each had something, or many things, that made it a special experience for us. I guess that's the magic of it all. Of the four parks though, Magic Kingdom was maybe the most magical of all. And the fireworks show that ended the day was breathtaking. I didn't have my Rebel with me for that, but did snap a ton of pics with my phone camera and got a couple to share with you. Not only were they spectacular but they played audio clips from Pinocchio's blue fairy and from other films about wishing and wishes. It was sweet. Right in the middle my son turns to me and says he wishes that everything in the world would be free for everyone. I thought that was sweet. It really did me a ton of good to be somewhere else for just a little while. This morning I'm looking around my home and thinking just how much I really do like it. There's a lot of comfort to home and I think going away for just a week was just what I needed to refresh, relax, and see things fresh again. So I'm going to push publish, help myself to another cup of coffee, and get to work. It was SO much fun chatting with you again and thank you for letting me share this experience. Have a wonderful day!!! Wow! In the two years I've been blogging I've never been this bad at getting posts out. I was thinking about why that is and I've come up with a couple of ideas. -I had the art for two magazine articles and the articles to do. -I got waaay too immersed in the projects for my son's birthday party. -I now see blogging as my "fun" thing to do so I don't let myself do it until AFTER I get my work done. -It's January and my seasonal affective disorder is in full swing. I feel bad about how reclusive I get but then I remember how much worse it was a few years ago. Six years ago I would curl up into a ball and not unwind myself til Spring. I thawed when the yard did. I think the Vitamin D I'm taking has helped a lot. So if you've e-mailed me and haven't heard back- I am so sorry. I try to make myself but honestly I haven't been on e-mail more then two minutes at a time all week. So I'm trying to see this little hiatus as me once again, showing by example, for all that struggle to get their blog posts done; these things do happen. Life interferes, depression may kick in for one reason or another, you might be working with deadlines and have no time for anything else. Or you may already be doing the super mom thing and one more thing at the end of the night is more than you can handle. Sometimes it's a simple choice between pushing out one more thing or getting some sleep and hoping to start the day out fresh. I've been opting for the second one lately. This weekend I finished the article I was working on and moved on to my son's birthday party. It's on Saturday and I feel kind of nervous because I've never actually thrown a real to goodness birthday party for him before. I've done bridal showers, I've done weddings, I've done baby showers, and have had family birthday parties in the past but this feels somehow like the big time. And because I'm me, I tend to deal with any nervousness I feel by planning and constructing and organizing. So I started brainstorming and came up with an explorer theme. We sent out invites to the "birthday expedition" that were wrapped in little bits of map. I spent most of one day writing and then printing, and then rubbing them all with distress ink so they looked all rugged and distressed. I had some amazing stamps from Oxford Impressions that I got for a book project and they fit perfectly into the theme so I creatively hand stamped all 19 invitations as well. By now I had hands stained with ink, art supplies all over the place and I was just getting started. I am an artist and it's easy for me to get interested in something if it's a chance to be creative. But I do tend to go a little overboard. For instance, after the invitation deadline had been met I took a trip to my local scrapbooking store and bought myself one of We R Memory Makers new Cinch machines. Because wouldn't it be cute if they had little explorer journals. Oh and wouldn't it be cute if they had cute little explorer bags. Oh, and wouldn't it be fun if they got little flashlights and compasses and we checked them in when they arrive like it really is an expedition? So now all of a sudden my cuteness meter is going into overload and I really can't help myself- I need to make those notebooks. Plus I had a coupon. It was the double whammy. So I now have a cinch machine and I've now invested hours just in putting together on the computer little nature explorer activity pages that we can include in the journals. At this point any right brained person is questioning my sanity. But you all know that the fun is in the details and really, hours spent creating are fun no matter what the excuse. But sometimes we do need excuses. I found mine for right now. I'm a mom with a birthday party to throw. Oh and it's gonna be so cool. Here's a little close up of a piece I've been working on. I like it lots. It's actually meant for a friend but I liked it so much I went back to the craft store and got another set of the stickers and the rub on's I used so I can make another like it for me. I'm kind of surprised I like it so well. To be honest, during the actual creation process I felt really nervous. Things felt off balanced and that made me uncomfortable. There are sometimes pieces that do this to me. When I started this piece it was just like striking out on a path. I had a view of the distant mountains I wanted to reach and a place to start but I took it on faith that the path will go all the way to the top. That it won't disappear somewhere over a rise. That it will remain walkable. When I begin a work I often put that one big focal piece on first. In this case, the bird. As soon as I do though, the rest of the canvas seems completely unbalanced. This bothers me and my instinct is to quick throw something else on that will balance the space. But I've learned that I need to take things slowly, and make comp decisions based on what I envision the end result to be. Not as reactions. It's so easy to create based on reaction to action. And a lot of my best pieces have followed that process- so I'm not saying that it's a bad way to create. But with some pieces I can envision what I want it to look like before I ever begin. To realize that vision some elements might have to be added in a certain order. That doesn't allow me to throw something on just to comfort myself during the process. I feel uncomfortable. I may even want to walk away. It's so hard not to reach for something-anything, that I know will alleviate the tension. But I make myself wait. I make myself walk the path I'd laid out in my mind before I began the piece. I stitch, or layer, or doodle and may even play a little within the limits of the vision I have. All week I've been trying to come up with the idea for something amazing. I wanted it to be as close to genius as I can get. It sooo wouldn't come. The ideas were there but nothing in the way of what I felt I needed. So I took my (and your) advice and decided to give myself a little bit of time to play. I had a deadline looming yes, but it's like a pre-game stretch. I need to play around for a while just to get into my groove. And groove it I did. :) I took pics of both my warm- up and a close up sneak peek of the piece I did after to share with you. For the warm up I was playing around with watersoluble materials like Distress inks, inktense pencils, and fabric markers on wet fabric. The fabric I used was a sheer curtain fabric someone had given me. It felt pretty polyester-y but still absorbed water fairly well. To begin I tried rubbing the ink on the fabric and then wetting it by putting it face down on a slightly wet surface. That produced a pretty watercolor effect. Then I started to work into it with the inktense pencils, and other inks. How wet the fabric was definitely made a difference in how opaque the color and how much it bled into the area around it. I found I really liked how intense the pencils were so I wet a second piece of the fabric and started to draw some butterflies. I wanted to see how they performed when sketching and not just laying down color. After I sketched in the color of the wings with the pencils I grabbed a fabric marker and outlined a bit. I LOVED how that looked. The marker bled into this fabulous watercolor look while still maintaining a line. Gorgeous! These were my play pieces- after which I started work on the mixed media work for the magazine. Because I was feeling energized and "in the groove" already from the playtime I was able to really jump into the mixed media piece already feeling connected to that artist part of myself. All in all I'm really glad I took the time to "warm up" my creative side with play. I spent tonight writing an article for one of the mixed media magazines. It's supposed to be a 1000 words and I've got 800 with only the intro and tools and materials list. It's so easy for me to write. I can go on and on and in fact when I write a blog post I end up editing out half of it before I click publish. You don't want to read that much. Trust me. Sometimes though I finish a post and in reading it found I was sharing something I didn't feel comfortable sharing. Sometimes I'm just not ready. Sometimes the story I'm telling isn't my own to tell. So I edit. Sometimes though I'll finish a post and publish without changing a thing. Those posts pour out of me direct from my heart. I'm so excited or determined to share something I believe with you. Some message I know some of you will read and relate to. I love getting your e-mails and comments that tell me a little of how a particular post really hit home with you today. It's truly a wonderful venue. I love being able to write something and know that within moments of clicking "publish" anyone from as far as Sweden or Malaysia or Australia can read that message. I can't control who reads these posts, but I trust that when I write something heartfelt that the right people will be reading that day or will later stumble upon it just when they needed it's message the most. I love writing all the other types of posts too. The one's I write on days I feel clever or humorous. The posts I write that just tell you where I'm at and wonder if any of you are there too. I especially love hearing you encourage others in your comments or being SO SO sweet and encouraging me. Thank you for that generosity. I have to admit that when I started this blog it was to begin building a group that I could later tell about my book. But you've become so much more. So what began as a simple post about editing has become a letter to you, reader, and will end with my thanks to you. Thank you for reading. I appreciate it so very very much. So my New Year's Resolution list comes with a confession. I've forgotten how to dream big. Well, maybe not forgotten but to be honest I've been so goal centered (the book) the last couple of years that I've haven't made the time to really sit down and devote some time to dreaming. Do you do this? Get so wrapped up in the next thing on your to do list that you get to the bottom of the list without realizing it? I need a new list. In the past, when I've felt direction-less I'll think of the new things I want to learn, or the people I want to spend time with, or the yummy art materials I'd like to play with, or the places I'd like to go. But I feel like I need something more. I don't have a ton of time so do I concentrate my creative energies on publishing? on producing/selling? on promoting? Really right now I just want to give myself some time to play, and explore. I've felt so tapped the last couple of week. It might be the strep infection I found out I have, or it might be more. I'm not sure yet. But I'll tell you what my plan is- I'm going to pray about it, then I'm going to make some lists, I'm going to do some journaling, and I'm going to give myself some free time. Then, I'm going to come here and share it with you. What do you dream about and how do you identify those dreams? How do you distinguish between wishes and dreams? I've got a post about what I think the difference is here. Do you make a grand plan for the year each January? I'd love to know so please leave a comment!! !